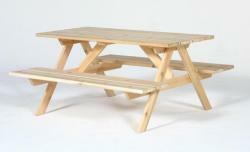 The simple, square Adirondack table is solid, and functional. It is the height of the paddles, so it fits into the set very nicely. It is inexpensive, and serves a variety of purposes. 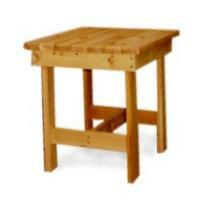 Many customers order 3 or 4 to serve as dinner trays, end tables, card tables, and even plant stands. The Garden Fancy Table is matched to the Folding Adirondack Chair. Notice the curved top supports. The table top is oversized, and matches the height of the paddles. 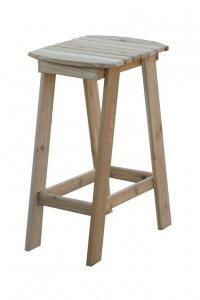 A favorite in Europe, this is our number one International export piece. 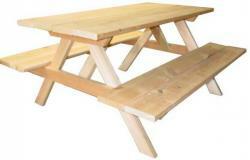 This 36" table is a great add-on. 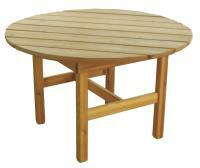 The 36" Round Table is ideal for snacks or barbeque dinners. 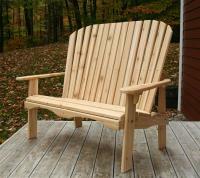 It matches the Adirondack Chairs. 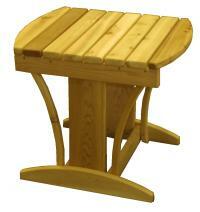 Use it as a coffee table with our product line. TA great addition to any outdoor area. Matches the Garden Chair. 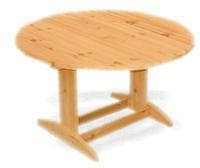 This table is 46" Round and can accommodate four chairs. Can be purchased separately or as part of a set. Can also be ordered with an umbrella stand cut-out in the center. Two Director's chairs and a Director's Side Table make an ideal patio set.��Perfect to watch all the action from lake or beach front decks.��Match four Director's Chairs with our "High Rise" Garden Table and you have a perfect "Bistro" dining set!